Nothing screams “Home for the Holidays” like home cooking and of course gingerbread. Dive into the wonderful world of maple syrup, ground ginger, allspice and powdered sugar as you bite into this decadent creation. 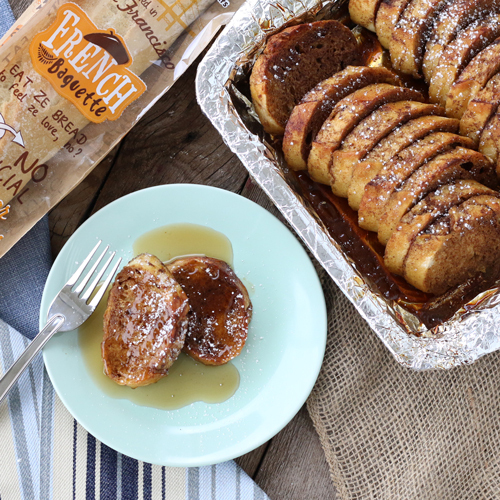 Made on our tasty French Baguette, this Gingerbread French Toast is sure to leave you feeling holly and jolly and ready for the holiday season. Brunching? This dish is sure to be the talk of the table with loved ones over a mimosa. Melt the butter and transfer to large bowl to cool. Line an 8-by-8-inch baking pan with foil. Arrange bread slices in 2 rows in pan. Once butter has cooled, add eggs, milk, maple syrup, molasses, cinnamon, ginger, allspice, nutmeg, cloves and salt and mix thoroughly. Pour the mixture over sliced bread, covering completely by spreading slices apart and pouring mixture between each slice. Cover pan with foil and refrigerate for several hours, up to overnight. When ready to bake, preheat oven to 350°F and bake, uncovered, until liquid is absorbed and French toast is set (approximately 20 to 35 minutes). Once baked, dust with powdered sugar and serve with maple syrup, if desired.